Le Petit Prince & The Aviator Special Edition. Please, draw me a sheep! � A stranded pilot in the Sahara meets a little prince with this unusual request, which marked the beginning of one of the most extraordinary mentoring relationships in literary history. After three unsuccessful attempts at drawing a sheep, the frustrated aviator finally draws a simple box, claiming that the sheep is inside it. The little prince is satisfied.  The curiosity and impartiality of the little prince forces the pilot to question his actions again and again, until he learns that true creativity arises only by questioning, like the drawing of a sheep in a box. 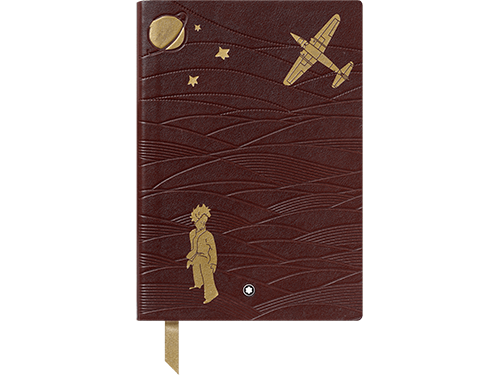 For us, it is reason enough to make the sheep one of the heroes of the Le Petit Prince & The Aviator collection. Engraved on the nib of the writing instruments, it should remind us of what changing perspectives can achieve._____________________________________________ LE PETIT PRINCE SPECIAL RESIN. 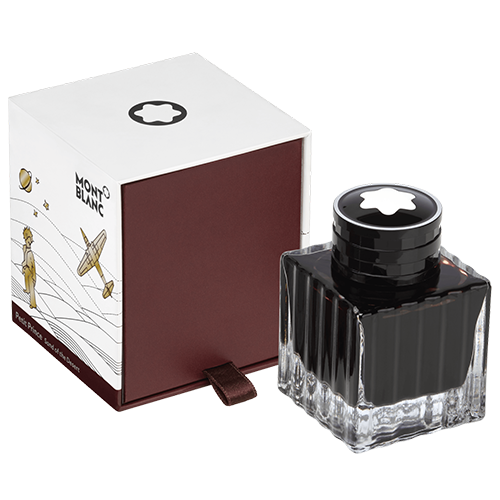 The Meisterstuck Le Petit Prince LeGrand Fountain Pen in dark brown precious resin is linked to the aviator aesthetic. The cap reveals a sentence from the Le Petit Prince book and is crowned with the iconic emblem. The central ring of the three platinum-coated rings features the Montblanc brand name and the clip is embellished with a yellow lacquered star. The writing instrument is finished with a hand-crafted Au 585 /14 K nib garnished with the Petit Prince's sheep drawing, a symbol of the bonding between the two characters, and is available in M, F and EF widths. The LeGrand fountain pen is piston fill and the Classique is cartridge/converter fill.____________________________________ MEISTERSTUCK LE PETIT PRINCE DOUE CLASSIQUE. The Meisterstuck Le Petit Prince Solitaire Doue Classique Fountain Pen with dark brown lacquer barrel is linked to the aviator aesthetic. The platinum-coated metal cap, etched with the drawing of the desert and airplane, reveals a sentence from the Le Petit Prince book and is crowned with the iconic emblem. The central ring of the three platinum-coated rings features the Montblanc brand name and the clip is embellished with a yellow lacquered star. The writing instrument is finished with a hand-crafted Au 750 /18 K champagne gold-coated nib available in M and F widths and is garnished with the Petit Prince's sheep drawing, a symbol of the bonding between the two characters. Cartridge/converter fill.________________________________________________ MEISTERSTUCK LE PETIT PRINCE SOLITAIRE DOUE. The Meisterstuck Le Petit Prince Solitaire Doue collection features a platinum-coated barrel with etched drawing of the desert and the Petit Prince. The cap is made of brown premium leather finely embossed with the drawing of the desert and the aviator*s aeroplane. The Platinum-coated clip with lacquered yellow star. The fountain pen is finished with a hand-crafted Au 750 /18 K champagne gold-coated nib available in M and F widths, and is piston fill.